The letter opener is marked "Keystone Metal & Plating Works SF" on the bottom. I found a reference to this company in around 1885. There is a beautiful patina on the letter opener that only comes with age. I estimate the letter opener to have been made circa 1920 or earlier in an art deco style. I purhased the letter opener about 30 years ago in a fine antique store in San Francisco in a converted waterfront warehouse. There was a view of the Golden Gate Bridge in the distance. I wanted to find an antique from San Francisco to remind me of this wonderful visit. I chose this beautiful bronze letter opener made in SF and always kept it on my desk until now. The letter opener is beautiful desk art and a great find for a letter opener collector. The letter opener is in excellent antique condition with expected wear. There is a nice patina and a few spots of tarnish. There could be surface scratches. The tip does not appear to be bent (which is a common condition issue with letter openers). There are no chips, cracks or other damage. Marked: Keystone Metal & Plating Works SF. This is a great opportunity to acquire a rare and beautiful antique bronze letter opener made in beautiful San Francisco. 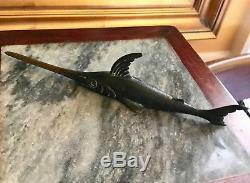 Enjoy the old bronze swordfish for years to come - on your desk, in your office or as part of a valued collection. No charge for packing materials. Please examine the photos to assess the condition for yourself. Other items shown in the photos are for display purposes only. 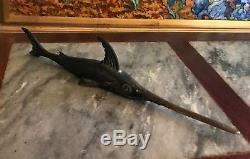 The item "Rare Antique Keystone Metal Works San Francisco Bronze Swordfish Letter Opener" is in sale since Sunday, October 14, 2018. This item is in the category "Antiques\Decorative Arts\Metalware". The seller is "wilderness03" and is located in Deerfield, Virginia. This item can be shipped to United States.